CLASH POLL: Who's LIED To The FBI More - Flynn Or Hillary? CLASH POLL: Who’s LIED To The FBI More – Flynn Or Hillary? Because if admitting to ONE lie is enough to bring Flynn to the brink of personal ruin, what’s in store for the Lardy Hagfish? Thanks to the work of the ‘Independent Counsel’ willingly using heavy-handed tactics like an armed pre-dawn raid on a husband and wife while they’re asleep in their beds, we have a Four-Star General that has no choice but to sell his home. His personal life is in tatters. And what we know so far is that he has been compelled to admit to a single lie told to the FBI. Trump told reporters he feels ‘very badly’ for Flynn, a retired general who served in his White House for a brief period after the inauguration. ‘Flynn lied, and it’s like they ruined his life. It was very unfair,’ he said. We ALSO know that one of the lead investigators that has just been forced to let go is avidly Anti-Trump. Coincidentally, he was also reportedly involved in the Hillary Email case. It’s fair to say that whatever Comey’s personal motivations might be, they are NOT pro-Trump. So let’s roll tape back to a conversation between Comey and Trey Dowdy. Question after question after question put to Comey about Hillary’s veracity came up false. Comey even admitted that ‘false exculpatory statements’ are often used to establish ill intent. And intent, you will remember was the very excuse Comey used to justify exonerating Hillary. When he claimed Hillary ‘Lacked Criminal Intent’. And what about all the sketchy things that happened in the email investigation? Not just the Tarmac meeting or the pressure Comey had us believe was coming from the AG, either. All the other weird things. In fact, when Jason Chaffetz was asked about it this morning on Fox, he indicated agreement with the idea that a discredited and politically motivated investigator who was involved in both the Trump Investigation AND the Hillary one might require the Hillary email investigation to be reopened. It has been estimated that one in 25 Americans is a sociopath. As described by Dr. Martha Stout in The Sociopath Next Door, a sociopath is a person who lacks a conscience and whose behavior is marked by deceitfulness, irritability, and lack of remorse or responsibility when causing harm to others. Can you say, ‘Hello Hillary!’ She fits that description to a ‘T’, eh? 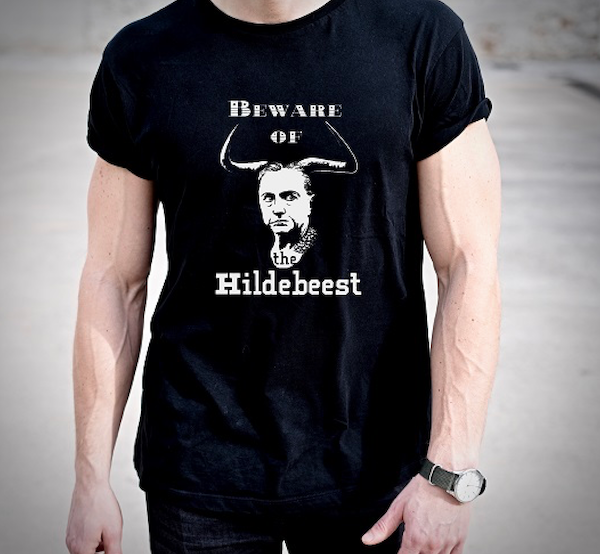 That’s why we renamed her, ‘The Hildebeest.’ Buy this shirt and warn others of her menacing presence. Make sure to wear it around relatives and associates who voted for her. Enjoy. Share if you want an unbiased investigation into Hillary’s illegal server and missing email.